After a recent funding round, Beijing-based Ofo netted $450 million and joined the unicorn club of private companies valued at over $1 billion . Among its backers are ride-sharing giant Didi Chuxing and Jack Ma’s Ant Financial (part of Alibaba). Ofo operates in 80 cities around the world and its customers take 15 million trips every day. And it all began over a fried chicken lunch only three years ago. Back in 2014, founder of Ofo, Dai Wei, and four classmates from Peking University were debating business ideas over a KFC lunch. Among them were cycling tours for tourists and a car-rental scheme. Within a year they had settled on a different idea – a bike-sharing service powered by an app. Bike sharing would eliminate the problem of lost or stolen bikes, and provide users with transportation to and from public transport, the founders reasoned. Unlike other city bike-sharing schemes, there are no docking stations for Ofo bikes, which can be left anywhere. Users – there are 10 million in China and counting – download an app, type in a number attached to the bicycle and receive a passcode, which allows them to unlock it. It’s cheap – as low as 30 cents a ride – and easy. Another feature allows users to share their own bicycles on the app, which gives them access to all the Ofo bikes. Global expansion plans Ofo is currently in 34 Chinese cities including Beijing, Shanghai, Guangzhou, Shenzhen, Chengdu, Kunming, and Hefei. It aims to launch in 20 countries by the end of 2017 and already has a scheme in Singapore. It has been piloting a scheme in Cambridge, in the UK, albeit a small one. But Ofo isn’t the only bike-sharing company on the block. There are at least a dozen other bike-sharing startups in China. The company with the next-largest market share is Shanghai-based Mobike, which has funding from Chinese internet giant Tencent Holdings Ltd and private equity house Warburg Pincus. Mobike recently launched in Manchester , in the UK, which became the 100th Mobike city in the world and the first outside of Asia. Bike-sharing schemes are good for the environment. They help to reduce emissions and provide valuable first/last mile transportation to bridge the gaps in a commute by train or subway, where people might otherwise jump in a cab. 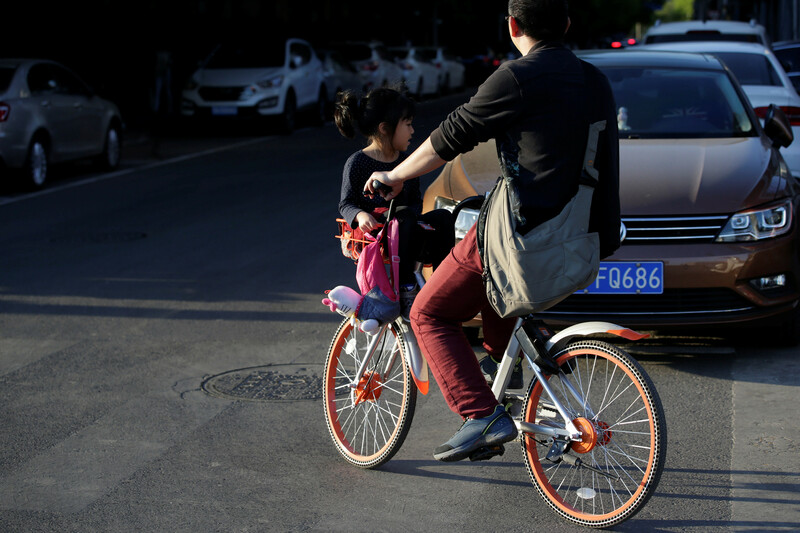 Mobike claims that “Mobikers” have cycled a combined distance of over 2.5 billion kilometers in the year since its first bikes hit the streets – the equivalent of taking 170,000 cars off the road. In fact, according to a white paper by the company , cycling has doubled in usage over the last year, accounting for more than 11.6% of total transportation today versus 5.5% a year ago. And China is a world leader in bike-sharing schemes, according to the Financial Times. 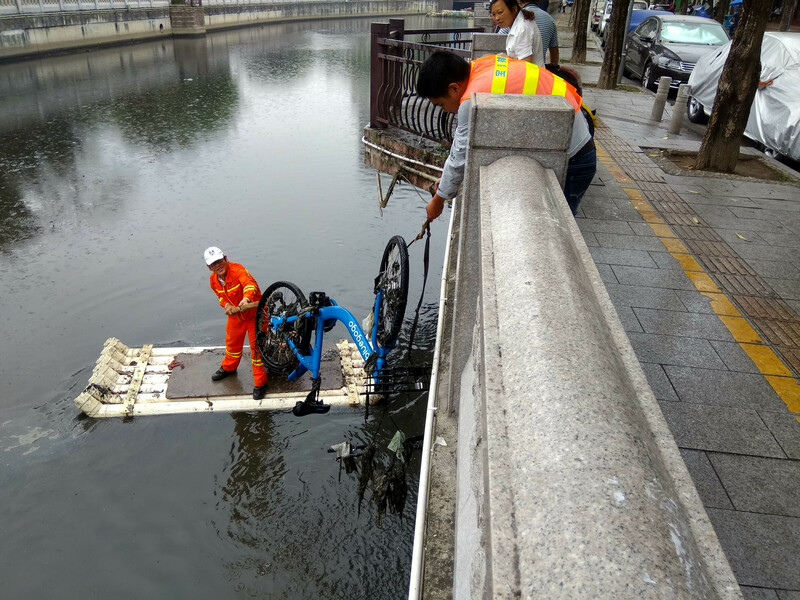 But bike sharing does not come without its share of problems. The absence of a dock, for instance, means that bikes can be parked carelessly . In some cities, such as Shenzhen, they have been discarded in piles, or thrown into waterways. This could bring about increased regulation by city authorities, as well as extra costs for the bike companies to retrieve the bikes. Despite its success so far, some analysts fear that the bike-sharing business model doesn’t make financial sense , and that the companies will find it difficult to turn a profit. One of the issues is that the intense competition for market share between bike-sharing companies results in lower fees for bike rides – and lower profits. Investors don’t seem to agree, however. Ofo looks to be increasing in value again as latest figures put the company’s worth at $3 billion. And there is also value in the data provided by the GPS trackers on the bikes. It could help companies like Ant Financial target their products at users, and municipal authorities to better plan city layouts. Ofo says that improving the user experience is key to its success, including adding GPS to the bikes to track their location and changing the tyres to make them more sturdy. The setbacks certainly haven’t dampened the ambition of Wei, who is a World Economic Forum Global Shaper with the Beijing hub . “We want to make the world better. Solving the problem of traffic jams, bringing a healthy and green lifestyle is our mission,” he says.